“Are you going to be able to enjoy this vacation?” someone asked me, knowing it would end with leaving my daughter thousands of miles away. “I sure hope so,” I answered since we, after the whirlwind that is Senior year, really needed this vacation to be a vacation. The next morning we got up and started packing the car, not just with luggage for the trip, but with moving boxes. Setting our GPS to our first destination, and pulling out of the driveway was nothing short of surreal. 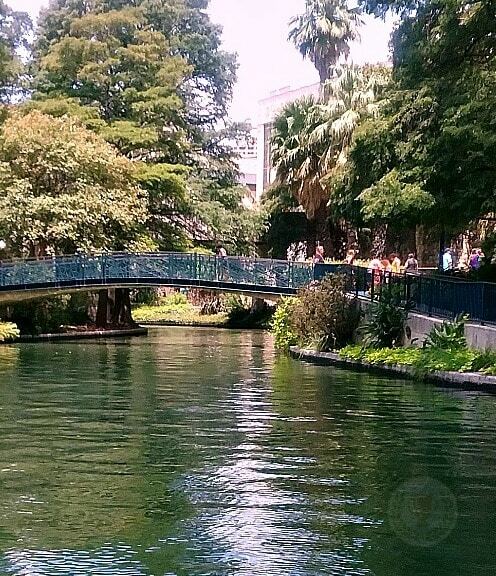 About three hours later, we arrived at our first scheduled stop, The Riverwalk in San Antonio. Because of the time of day, it took a little while to find an open restaurant. After lunch and a short stroll, we were on our way again, this time to Carlsbad, New Mexico. I’d reserved a cute little apartment for us to spend the night, and made plans for us to tour Carlsbad Caverns the next morning. After what seemed like endless hours of driving through the Texas hill country, the terrain eventually changed and we found ourselves winding through the west Texas mountains. Harold, Hannah’s car, was doing great, until he wasn’t. Climbing those mountains in the hot, midafternoon heat proved to be too much, and unbeknownst to us, Harold began overheating. It wasn’t until we stopped for a restroom break that we realized something was wrong. We drove to a nearby Subway for dinner where we also started calling around town for a mechanic. As one mechanic told us, “It’s going to be hard to find someone on a Saturday at this time of day. Everyone’s closed up for the night.” Having a whole town shut down at five in the afternoon isn’t something we’re accustomed to as city folks. The mechanic took the time to listen on the other end of the line as Mr. Hines described what was wrong with the car. I guess he took pity on us considering we were desperate and the town was basically shut down, because after telling us he was a diesel mechanic, not a car mechanic, and had closed for the day, he told us to come see him, and he’d see what he could do. Small town roads and GPS directions don’t always match up, so after passing our turn-off several times and arguing over the directions, we finally rolled into the kind mechanic’s driveway. The mechanic left his son to tend to the grill as he walked over to greet us. Turns out his shop and home were one and the same, and we’d arrived at dinner time. Mr. Hines explained again what had happened, and Travis asked to look under the hood. He believed there was either a leak, or the coolant got too hot and caused the radiator cap to blow off. He sent us to the hardware store for coolant, wished us well, and instructed us to find a mechanic when we got to New Mexico. When we offered to pay Travis, he rejected our money saying, “If I can’t help somebody out every now and then, I ain’t no good.” We accepted his generosity and headed to the hardware store. We walked into the store, which looked more like a gift shop, convenience store and Walmart rolled into one, with not much time to spare before closing. The employees were kind and helped us find what we needed, then locked up the store behind us. Once outside, Mr. Hines proceeded to pour the fluid into the radiator as Travis instructed. Hannah, although concerned about her car, was pretty good-natured about it, deciding to poke a little fun at her Dad as he poured coolant into the car. He was in no mood and tension filled the air. I “invited” Hannah to leave her Dad alone and wait in the car with me, where I pondered the events of the day and wondered how this particular story was going to end. Were we going to have to stay the night here and cough up money we didn’t have for car repairs? Were we going to lose our Airbnb reservation? Could the car make it to California? 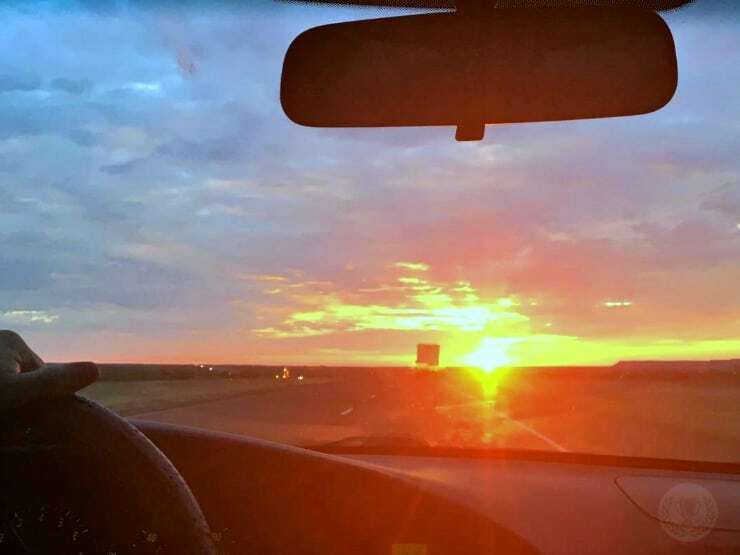 Two hours after our unexpected detour, we were back on the road to Carlsbad, just in time to witness a gorgeous west Texas sunset. In that moment, nothing else mattered, not even the fact that we’d decided to forego air conditioning and roll down the windows so Harold wouldn’t overheat again. As day faded into night, the air cooled and the car ride became more tolerable. I eventually drifted off to sleep while Mr. Hines and Hannah talked away the time. It was midnight or so before we reached our Airbnb, and unfortunately, we spent several minutes driving around the parking lot before finding our Airbnb, again trying Mr. Hines’ patience. Needless to say, things were a bit tense as we unloaded our bags and climbed the steps to the second story apartment. After a brief walk-through of our home for the night, and briefly flipping channels on the television, we called it a night.